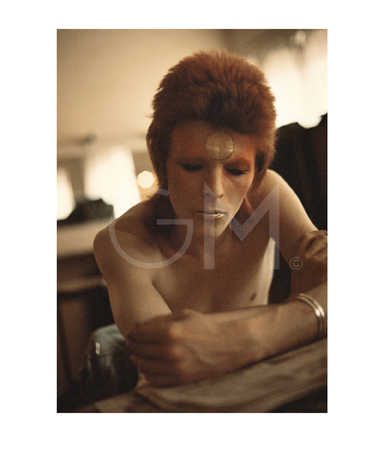 The Lucy Bell Gallery is currently showing an exhibition of extraordinary photographs by Geoff MacCormack, documenting his time and travels with his "brilliant pal" David Bowie. "Just suppose your Brilliant Pal said 'Will you join my band [The Spiders from Mars] and come on a tour? And would you mind awfully if we travelled [first class] by sea to New York, and then sailed from Los Angeles to San Francisco, Canada, Hawaii and on to Japan? And then, from Japan to Siberia, through Russia [Trans-Siberian Express] to Moscow [for May Day Parade], Poland, East and West Germany, just in time for tea at the George V Hotel in Paris? Followed by a relaxing holiday in Rome, just to chill out?" TeamPB were privileged to meet Geoff MacCormack at the preview of his exhibition at the Lucy Bell Gallery earlier this month. In a world where everyone appears to be a photographer, Geoff is adamant that he is not. Instead he said he had a fortunate few years travelling with a great friend. His portraits of Bowie are captivating - Bowie appears to be looking right at you, allowing the viewer an intimate moment with their hero. There are also beautiful captured moments of reportage, a style of photography that today is so often fabricated and controlled. A worthy exhibition. At the Lucy Bell Gallery St.Leonard's until September 13th 2018.